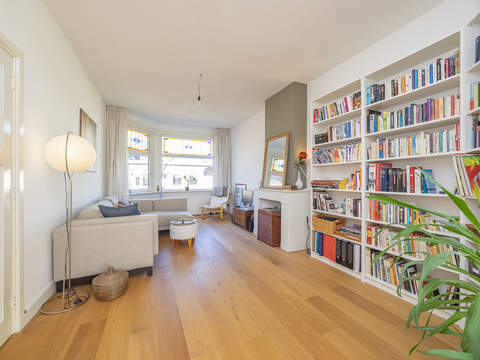 Ligusterstraat 30 Price asked € 239.000 k.k. 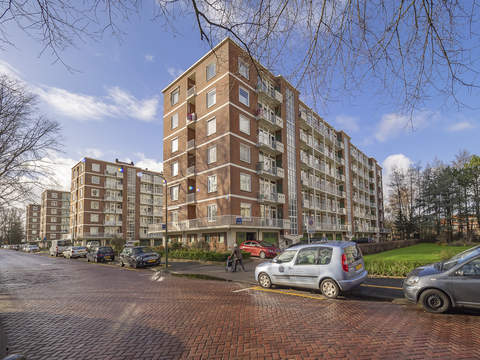 Beautiful located between the Valkenboskade and the Goudenregenstraat, spacious and bright 4-room top floor apartment with a living surface of approx. 94 m², 2 bedrooms and a spacious sunny terrace facing South East. The apartment is located in a quiet and green street with ceiling heights of 2.80 meter. Beach on 8 minutes cycling distance. The copsy shoppingstreet Fahrenheistraat as well as the tram stops of randstadrail tram 3 and tram 12 on 2 minutes walking distance. Via open porch entrance on 1st floor, internal stairs to 2nd floor, spacious L-shaped hall with skylight and deep storage cupboard, neat toilet with handbasin, spacious kitchen approx. 3.37 x 3.01 with equipment such as 4-burner gas hob, extractor hood, oven, dishwasher, washing machine connection and door to sunny terrace approx. 3.20 x 3.30 facing south east. Cozy living / dining room approx. 10.43 x 3.29 with laminate flooring and fireplace. Two bedrooms at the front respectively approx. 3.96 x 2.03 and approx. 3.96 x 2.11. Spacious bathroom approx. 3.40 x 2.11 with bath and washbasin. Situated on lease-hold land, passed by 08 August 1992, but perpetually renewed through obligatory contract. The rent charge is € 64,68 per year, based on a land value of € 4.312,- and a rent rate of 1,5%. Review rent rates by 01-01-2023. 1/3rd share in the community. Active Owners Association, contribution € 25,-- each month. Electricity 6 groups with circuit breaker. Central heating system, brand Ferroli. The apartment has synthetic window frames with double glazing. Living surface approx. 94 m². The volume of the apartment approx. 341 m³. Shops at het De Savornin Lohmanplein, Fahrenheitstraat, Goudsbloemlaan, Weimarstraat, Vlierboom- en Appelstraat, and the Center of The Hague. Bosjes van Pex, dunes, beach and sea. Public transport (RandstadRail Line 3, 12) and main roads through Westland Road and Hubertustunnel.